Shared here with permission of Coos County Democrat reporter Edith Tucker. RANDOLPH — Senator Kelly Ayotte traveled on Oct. 29 through Jefferson to the remote Pond of Safety in Randolph that — located behind the Proclamation Boundary — was added as part of a far larger tract some 15 years ago to the Kilkenny Unit of the White Mountain National Forest, using monies in the Land and Water Conservation Fund (LWCF). The LWCF has not depended on taxpayer dollars but “use revenues” from offshore oil and gas leases. It’s an account in the U.S. Treasury that collects a small percentage of offshore oil and gas leasing receipts, specifically intended to be spent on conservation projects. At local, state, and federal levels, LWCF provides grants to help conserve natural resources and protect outdoor recreation opportunities, working forests, and wildlife areas, all without tapping taxpayer dollars. 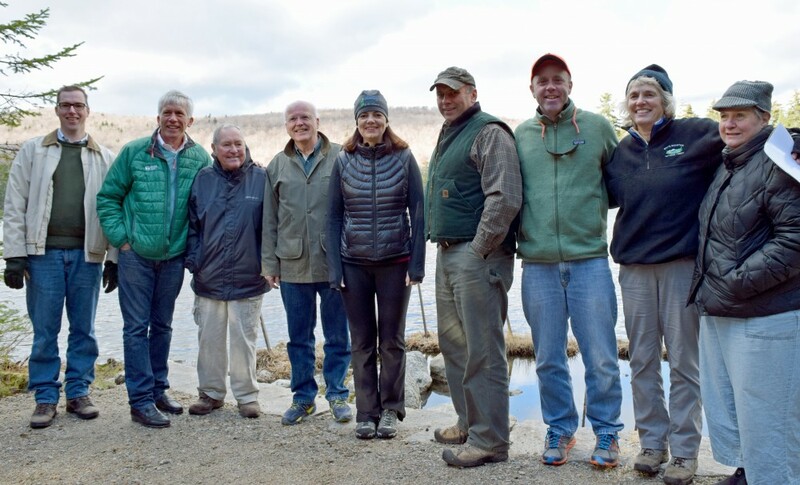 Now, however, Ayotte pointed out, the legislation establishing the LWCF has lapsed, and she said she is committed to see it reauthorized, including making speeches on the program’s importance on the Senate floor. On hand at the end of the new short mud-free path to the Pond and canoe put-in were: attorney Sheridan Brown, left, Randolph Community Forest (RCF) commissioner Walter Graff, town moderator & RCF commission alternate David Willcox, RFC commissioner Mark Kelley, and RCF commission chair John Scarinza, plus J.T. Horn, senior project manager at the nonprofit Trust for Public Land, WMNF Androscoggin District Ranger Katie Stuart, and Dodie Willcox. Ayotte would like to see it become a permanently funded program. On Oct. 8 she called for the passage of bipartisan legislation that she helped introduce with Sen. Richard Burr, a Republican of N.C., and Sen. Michael Bennet, a Democrat of Colorado, to permanently reauthorize the Land and Water Conservation Fund (LWCF). 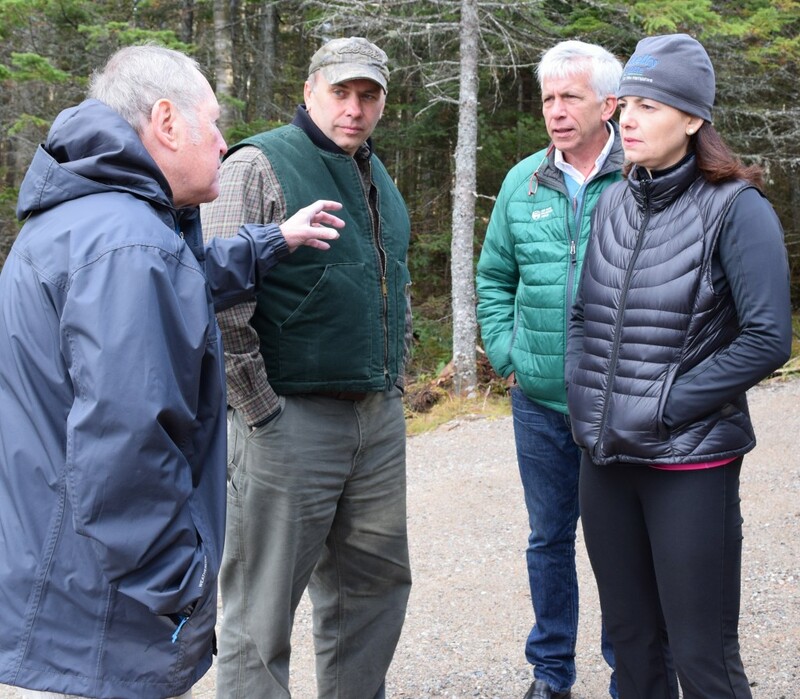 Randolph Forest Commissioners David Willcox, John Scarinza, and Walter Graff talk with US Senator Kelly Ayotte. The Fund has been used all across the country to create and protect national parks, areas around rivers and lakes, national forests like the WMNF, and national wildlife refuges from development, and to provide matching grants for state and local parks and recreation projects. Ayotte noted that many residents enjoy Mine Falls in her own hometown of Nashua that was acquired with LWCF help. Ayotte enjoyed looking at the high-elevation mountain pond, hearing its history as a place of refuge for paroled American Revolutionary soldiers whose descendents still live in Jefferson, and learning the story of how it happened that the low-population town of Randolph was able to acquire a 10,000-acre “working” town forest with acreage in Randolph and Jefferson. 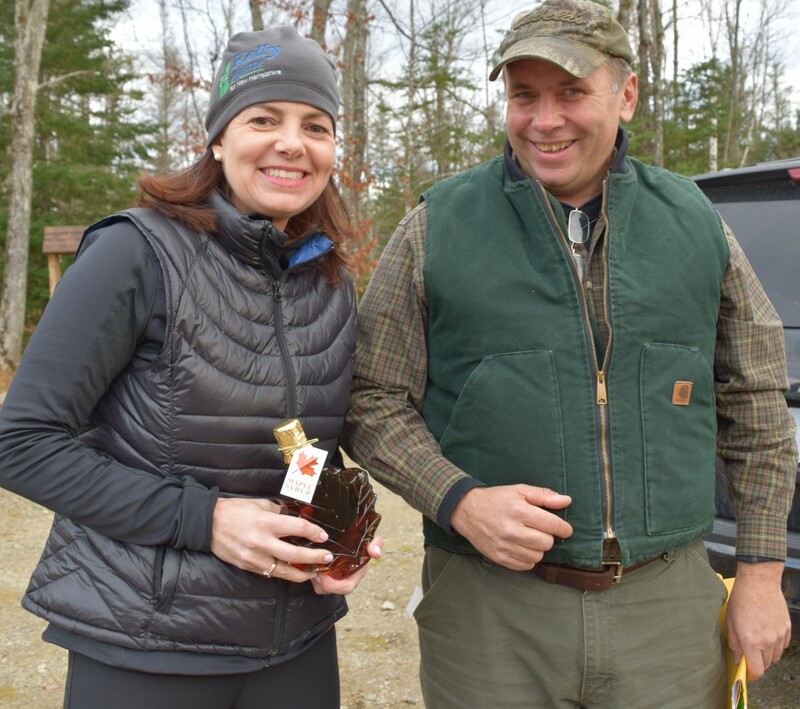 John Scarinza, Chair of the Randolph Community Forest Commission, presented US Senator Kelly Ayotte with maple syrup from his sugar bush. Randolph Forest Commission chairman John Scarinza gave the senator a maple-leaf-shaped bottle of maple syrup that he and his wife Jenn boiled last spring in their sugarhouse, using taps on private land in Randolph. Soon, Scarinza explained, if all goes as expected, Fuller’s Sugarhouse in Lancaster will be tapping sap on a designated tract on the RCF, generating revenue and four to six year-round jobs.